Business transactions over phone has become very common since everybody nowadays carries mobile phone in his pocket. Who doesn’t looks forward to easy accessibility and quick service? But many fraudulent activities have occurred ever since this became a trend and uncountable malicious acts have been registered. Nobody will look forward to this methodology of payment if there is any risk involved which might be an actually big set back to the economy. Semafone, a new startup, has directed its services to curb this problem by its fraud prevention software for call centers taking payments on the phone. Their services focus on reducing security concerns and compliance costs by de-scoping contact centers for Payment Card Industry Data Security Standards (PCI DSS). Enhancing security against fraudulent acts is their main concern and they focus on receiving secure payments and have successfully become the only IT security vendor to achieve four security payment accreditations. They have gained accreditation of Visa level 1 merchant, PCI DSS level 1, PA DSS and ISO 27001:2013 certification. They have been established since the past 6 years and during their initial time period they closely monitored their finances and the investment there were doing. Now with the success they have gained, they have moved beyond that stage and now focus intently on customer retention by maintaining A-class services. Retaining a customer is a key contributor to a company’s growth. They also keep on extending the recruitment process to increase their national and international customer pool. Every business establishment brings a long list of challenges. Most companies are not able to step up to the standards and face a certain defeat in the initial years. Semafone also faced such challenges but they managed to keep the dangers at bay. They had trouble keeping the same people for them as some of them were known and even on friendly terms. They also made many other mistakes by being over optimistic at times and trying to achieve too much. They also had troubles with the export market which restricted their movement. With the amount of success they have gained in the past few years and their annual turnover in millions has clearly indicated that Semafone is here to flourish. The records of last few years have displayed many security breaches making a ground for Semafone to do its work. Data security is a major concern of companies these days and so they are investing more in saving their reputation and data. 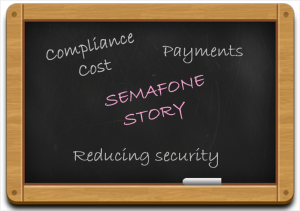 Semafone is expecting huge profits in future. Keeping your goals clear and a constant effort to achieve the same are sure to help you on your way to success when it comes to running a startup. Tim Critchley, the CEO of Semafone, focuses on value proposition and to keep the needs and demand of customers in a clear view. He says that executive education coupled with learning from a job provides perfect foundation when it comes to IT sector.